From its inception, the artistic collective known as Moksha Family has been a nexus of cultural and artistic expression in the Miami scene. Comprised of artists, musicians, technicians, and visionaries, we celebrate the mystery that unites us with an eclectic mix of performances by individuals and groups from the local and international communities. Some performances are contemporary. Some, traditional and sacred. All are magical, meant to explore the inner landscape on the quest for universal oneness. Moksha Family gatherings are celebrations of cultural harmony and higher consciousness; they are not your average events. “Moksha” refers to the Sanskrit term for liberation and enlightenment. Moksha Family believes the arts bring us closer to cultural and spiritual freedom. 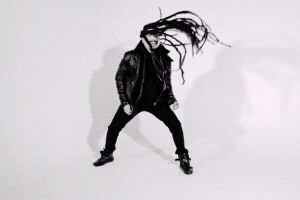 Afrobeta: is a live dance party. The music is emotionally enchanting and beat-driven. Cuci and Smurph wrap the crowd in deep melodies and bangin drums, inspired by coming of age, falling in love and the Miami Bass sound started by 2 Live Crew. Itawe: Locos por Juana’s charismatic front man, Itawe, is a well-established songwriter, producer and lead-singer. Respected by many as the leader of the vibrant Miami/Colombia/Caribbeantropical fusion sound now exploding across the globe, he is now also being recognized for his urban expressionist paintings and contemporary visual works. Born in “The City of Eternal Spring”, Medellin, Colombia and,since 1991, raised in subtropical Miami, Itawe was deeply influenced by the sounds and colors of his adoptive “Magic City.” Always fascinated by cutting-edge cultural movements and the creative community, Itawe began breakdancing at an early ageand, in the period from 1996 to 2003, became a well- known local graffiti Artist. Then in 2003, he listened to his irresistible call to music and founded Locos por Juana. DJ Aura: Robert Aura Freitag has been experimenting with music since 1992 and is best known for his technical mixing on the decks and computers for the style called I.D.M (Intelligent Dance Music). These recognitions have gotten him signed onto labels like Warp Records UK, Schematic, Isophlux, Merck and Beta Bodega to name a few. 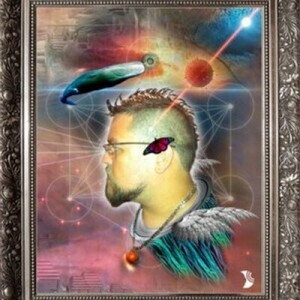 He has recently ventured into all styles of uplifting Electronica, Bass, Dubstep and glitchy hypnotic tunes which have left D.j’s and groups wondering “how the hell did he mix that?” When seeing and hearing Aura you will definitely feel his energy through the music, understanding that we are all one connected in this crazy place called the Universe. Music is not the only form in which he shows his love, but in art as well. Aura started his art journey designing flyers for his own events and CD covers for his mixes a couple of years ago and then found himself creating his own masterpiece artworks along the way. He now specializes in Visionary art, recreating his experiences of connections to the divine, gathering information in order to represent it as best as he can in this reality, showing that we are all conscious tools able to connect if desired. 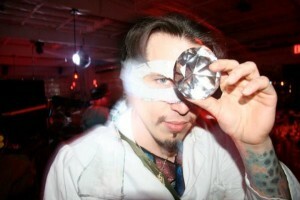 He has recently gotten into experimenting with animation and new 3-D Technology by XES (Xtreme Electronic Systems) which doesn’t require the use of 3-D glasses, being the first to use his art and making it able to see it come to life which has caught the attention of many events and festivals like Art Basel Miami at Moksha Family, Love Burn, and Earthdance Florida allowing him to display it for all to see. Using all of his gifts in conjunction is his way of showing how to understand and enjoy our Universal Language. 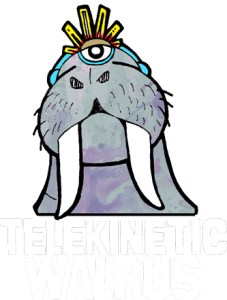 Telekinetic Walrus: is an experimental collective that creates a funky, psychedelic hip-hop, and electronic experience, that immerses the listener in an unexpected fantasy world of bass and space travel. Unabashedly wild and intent on amping up the crowd, this Miami-based crew has taken stages by storm and kept parties popping since 2009. The group delivers a mesmerizing performance wrought with the finest beats, eloquently articulated lyrics, and enough heavy bass to turn up an extraterrestrial dance party. Throw in some cosmic costumery, as well as some theatrical interludes and you can instantly feel their vibe in whatever city they happen to land their spaceship. Telekinetic Walrus is comprised of a group of intergalactic superheroes: Y Diz – Ableton Live Certified Trainer/Producer; The Time-Zoo Keeper – Vocals/MC; Corinne Stevie – Vocals/MC; Faun 5000 – Saxophone/Flute/Keys; Komakozie – Beatbox/MC. In the Summer of 2015, this team of elite warrior-explorers embarked on a successful two-month U.S. National tour, celebrating the release of their new full-length album, The Spaceship With The Heavy Bass Bump. Telekinetic Walrus focuses daily on spreading their music and positive vibes to a worldwide audience, while consistently producing live performances that unify people through active peace. Skinny Hendrix: Brady Jacob, aka Skinny Hendrix, has become a staple DJ/Producer in the Miami underground bass music scene over the last few years, opening up locally for EOTO, Daedelus, and HeRobust among many other touring acts as well as playing cities and festivals across the U.S.
His production style has evolved over the last few years, combining his electro/glitch hop/trap roots with his own quirky, outlandish take on contemporary electronic dance music. His skill set as a producer has grown due to hard work in the studio and his collaborations with fellow Miami vocalists/producers. 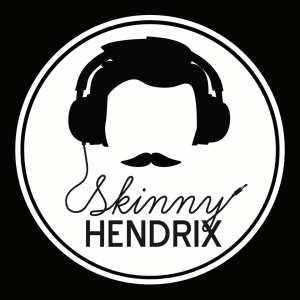 Skinny Hendrix is becoming known for original music that is as catchy and hilarious as it is one of a kind. SUBSQWAD: is the dj/production collaboration of Brian Amaral and Kenny Ferron. Their live/hybrid dj performances evoke a sonic journey of dance energy across a dynamic array of musical styles and influences while incorporating live sampling, scratching, and effects. 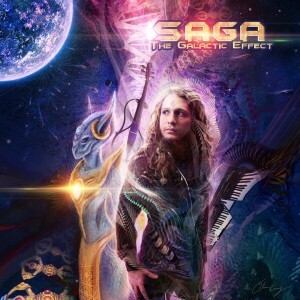 The Galactic Effect: Bringing in a cinematic twist to Electronic music. The sounds and performances of TGE blend many different realms and styles into one stellar glue. 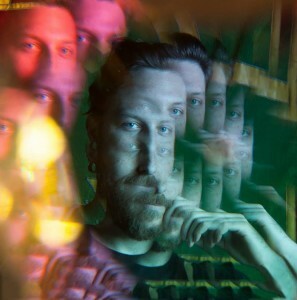 His sound crafting technique incorporates vibrant synthesizers and future bass with orchestral vibes, strings, and other world elements. Arranging music which defies all barriers, genre’s and labels, creating in constant change and movement, leaving the audience curious for the next possibility plucked out of the infinite spectrum of the auditory universe. Joe Abbati (aka Joa): is an artist/educator/electronic musician based in Miami. Joe has been making electronic music for more than 20 years. As a composer, he has scored close to 50 computer game soundtracks. 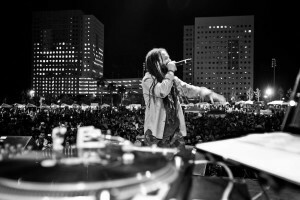 After leaving the game industry, he began teaching in the Music Engineering program at the University of Miami, where he is also the director of UM’s recently created Contemporary Media Performance studio – teaching private lessons and ensembles focused on electronic music making. 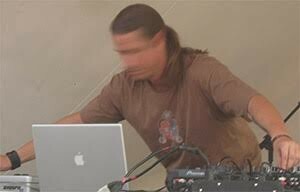 Joe was a regular performer at the early Moksha Art Fairs and psytrance parties like Universo Paralello in Brazil in the 2000’s. After taking a break to travel and work on an MFA in Sculpture/Interactive Installation, Joe is making a return to live electronic performance. His style ranges from Dark-Forest Psy to Ambient-Chillout vibes. EPHNIKO: is an emcee,songwriter, global funk selector,and producer whose music is rooted in the repetitive groove of hiphop and bass while expanding into the unpredictably eclectic.As a selector Ephniko moves crowds by combining African roots music from around the world with the electro-mechanical vibrations of the first world inner cities where he found his musical voice.He baptized his style of global dance as “SOUNDCOCHO.” He has performed in multiple festivals and concerts from Miami,Caracas,New York City and San Francisco to Capetown and Thailand with Industry heavyweights like Talib Kweli, Immortal Technique, Vico C, Cultura Profetica, Dead Prez, Grupo Niche, DubFX, Luciano, Danay Suarez, and Gondwana just to name a few. Smurphio: Tony Laurencio, aka “Smurphio” began his devotion to music at the age of 4. As a student of classical piano and acoustic guitar, he developed a strong foundation in composition and arrangement. After hearing the synthesizer intro to Van Halen’s, “Jump”, he fell in love with the art of synthesis. Over the years, Smurphio has become a “master” of the synthesizer. His virtuosic style has landed him many prestigious jobs as a “hired gun” for many pop and latin pop acts throughout the 90’s and 00’s such as Pitbull, whom he toured the world with for two years. Other acts include 5 time Grammy Award winners Bacilos, whom he recorded and toured with for 6 years as a keyboard/guitars/sequence specialist. 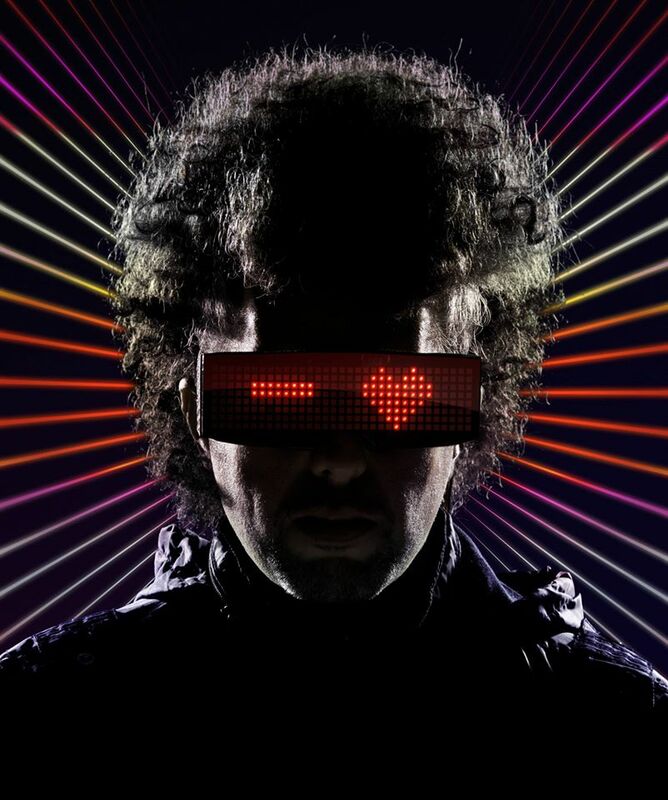 In 2006, he cofounded the electro/pop/funk duo Afrobeta with vocalist Cuci Amador. With Afrobeta, Smurphio has found his main outlet for musical expression. In 2009, they signed a recording contract with Do IT Entertainment, who are also the founders of the Ultra Music Festival in Miami. 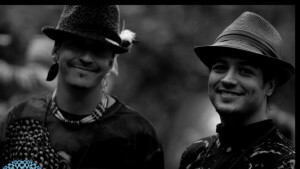 This has opened many doors for Smurphio and Afrobeta such as performing at the biggest festivals around the world like Glastonbury, Burning Man, Camp Bisco, and Ultra Worldwide. Recently, Smurphio just received and endorsement by Roland US, one of the largest and most renown synthesizer/music companies in the world. His devotion to merging organic and electronic music has made him an iconic figure in the South Florida music scene for the past 20 years. Otto Von Schirach: Also Known as Papaya God and Prince of The Bermuda Triangle is A Miami Bass Producer/Dj who’s beats will activate and enhance your Pineal Gland. From IDM to Cuban Miami Funk your ears, aura and booty will be most happy. ASHWORTH: Hailing from Miami, FL influenced by all things psychedelic, Ashworth’s sound ranges from dubbed out electronica to power noise. Incorporating traditional DJ setups and handmade electronic devices, you will see a unique performance. The bass will be deep and the dance will be lively. Expect the trip to be strange. ..including local heroes Moksha Family Arts Collective! Come celebrate with us as the global and local come together to ..create a true COMMUNITY EXPERIENCE! ?#?entertheportal? , ?#?omf16? 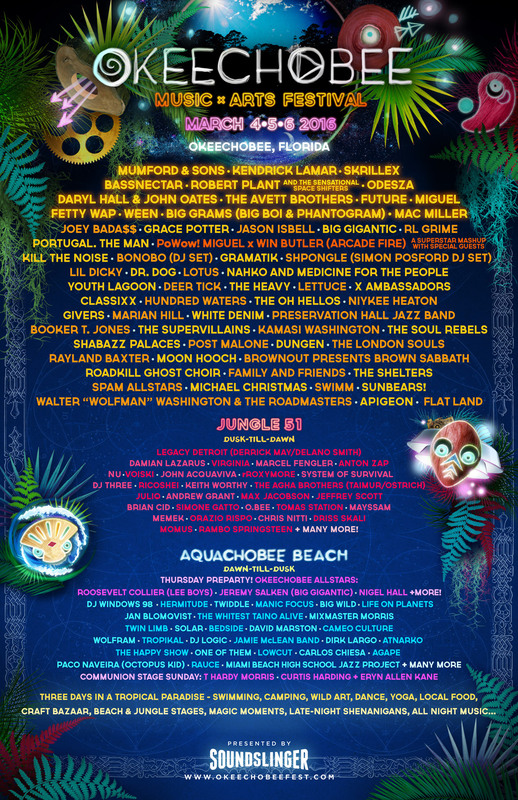 , ?#?okeechobeefest? , ?#?ChobeeWobeeVillage?